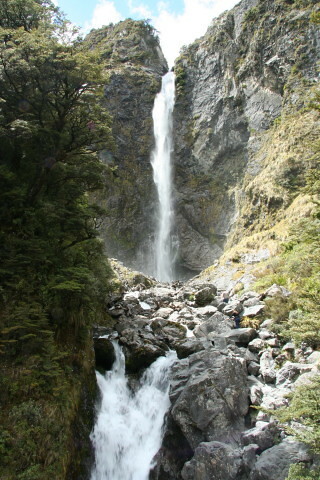 Short walk to impressive waterfall from northern end of Arthurs Pass. Although a relatively short walk and classified as "easy", there is a fair bit of climbing up a zig-zag path to the 131 metre falls. Allow 1 hour return. The track goes towards the waterfall visible from the carpark at the fork with the Bridal Veil track. Park at the carpark signposted from the northern end of Arthurs Pass.